Welcome to the Share Your Space feature for Clique Kits!! 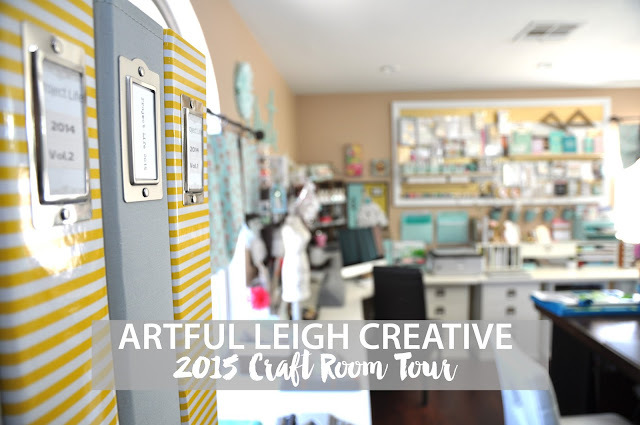 2015 Artful Leigh Creative Craft Room Tour! An overview of the room from the doorway . The room is above the garage, and measures 13 feet by 19 feet. I waited 11 years to turn this space into a craft room, and once the youngest started high school, we decided they didn’t need the play room anymore:) Hubby had the idea to rip out the carpet, and replace it with laminate. He knows me pretty well after 21 years, and since I am pretty klutzy, I had definitely dropped an ink pad or two upside down on the carpet before! :) Love having this floor that is so easy to clean. I made the standing height craft table in the center of the room, and have a detailed tutorial on my blog. It’s made of 3/4 inch Birch Plywood , and I hand finished the stain with a staining cloth and Minwax Bombay Mahogany stain. This table is 4 feet wide and 6 feet long, and has a 48 inch clearance all the way around for traffic flow. The bases are from Wal-Mart.com and the openings fit the 14×14 inch Itso Bins from Target. I also used a hand saw and miter box to make the frame for the pegboard, and spray painted and hung it all by myself as well. Hubby calls me “Bob the Builder”! Hee hee There’s a detailed tutorial for the pegboard also. We will start here on the left side of the room. 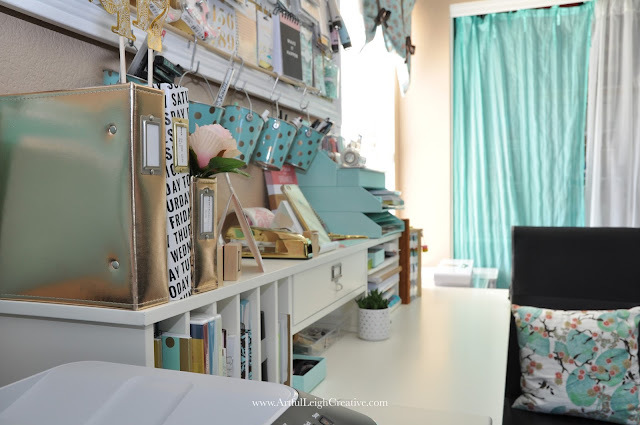 The two tall bookcases were repurposed from another room in the house, and I painted them with Antique White paint, color matched to the Antique White Bedford Desk units in this room. The first one on the left holds patterned paper sorted by manufacturer. Some of the paper holders I repurposed from those Priority Mail medium boxes that your scrap purchases come in. Painted, and covered with paper to match my room and the Target Itso Bins are in use here to hold larger amounts of patterned paper by manufacturer. The middle units are from Michael’s and an old entry bench I repainted, to hold card stock sorted by color. The right bookcase holds embellishments sorted by manufacturer. On top I like to display some of the mini albums I’ve made and my kid’s photos. The next bookcase holds My Project Life® albums, Core Kits, Inspiration and sketch books, and American Crafts White Card Stock, all purchased at 40% off or more with extra coupons. The rolling cart next to the bookcase holds Project Life® cards sorted by color and kit. I have a tutorial on that one too! 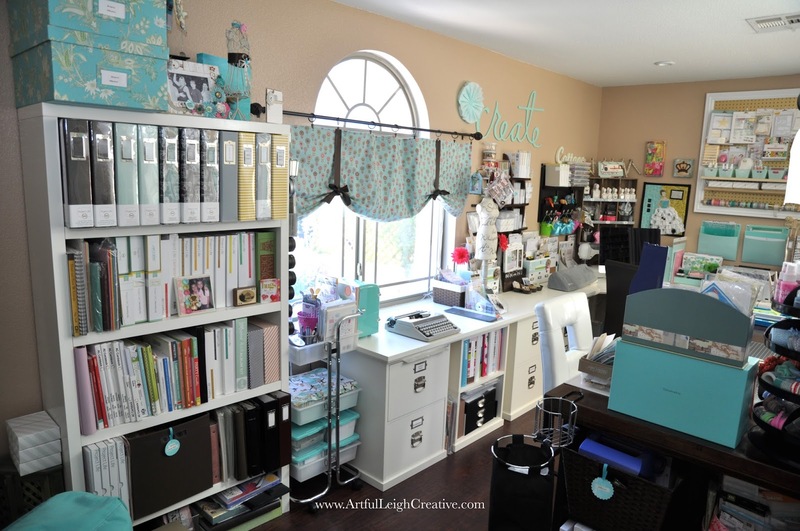 That first little brown basket on the counter holds Project Life® Theme Kits, some mini albums hang on the dress form, and you can see the Bedford Modular Desk Units from Pottery Barn. They were my one splurge in the room since I repurposed, made, or thrifted the rest of the furniture. 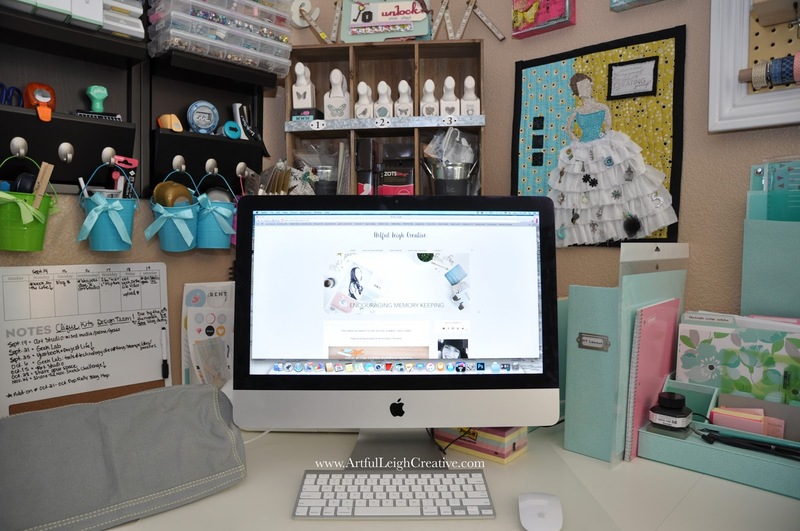 The Silhouette Cameo, sewing machine, and Mac computer are next in this area where I blog, edit and print photos. 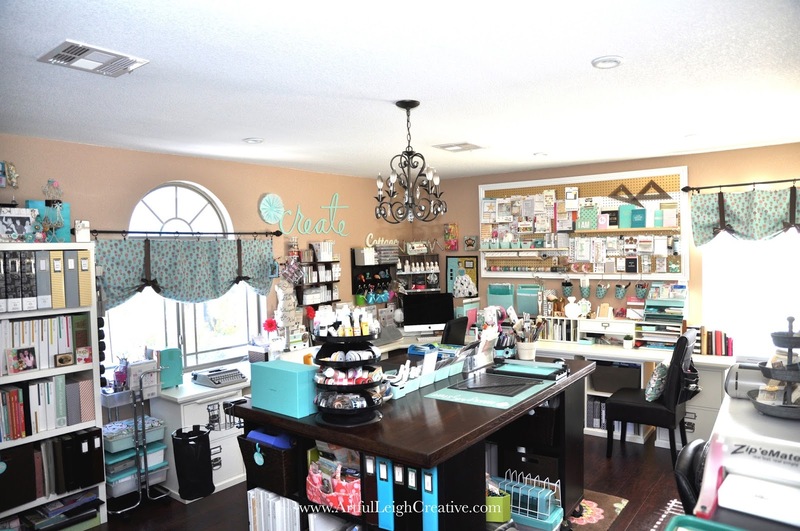 The Tiffany Blue file folders on the wall, and paper sorters, are by Martha Stewart for Staples. The wall quilt is by my Mom, and my sister painted the mixed media art above it. My grandma paints as well, we are all very crafty in my family:) The pegboard wall holds mostly American Crafts supplies, and was inspired by Heidi Swapp’s wall in her craft room, love the stripes! It sits above the Planner Station. I sewed the pillows and curtains from fabric by Basic Grey for Moda Fabrics. You can see the whiteboard behind my Mac, which I use to keep Design Team assignments in plain view. Kit embellishments sorted by color are on the wall along with my most used punches in the Target Dollar Spot pails. 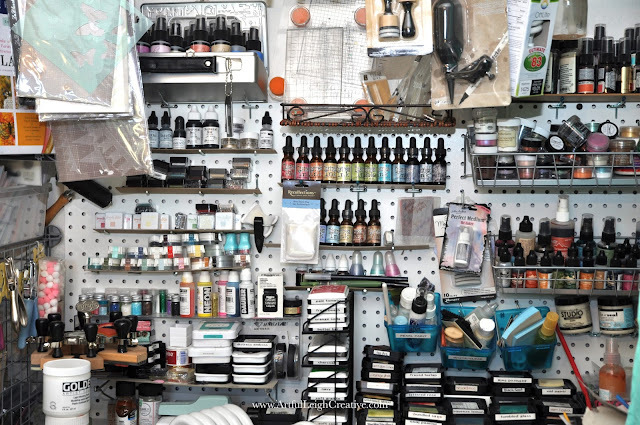 That weathered gray wall organizer is also from Target, and holds enamel dots, die cuts, black pens, pencils, and glue dots, and punches. To the right of the Mac is a magazine holder that I store my Design Team layouts in until I can file/photograph them and put them in albums. 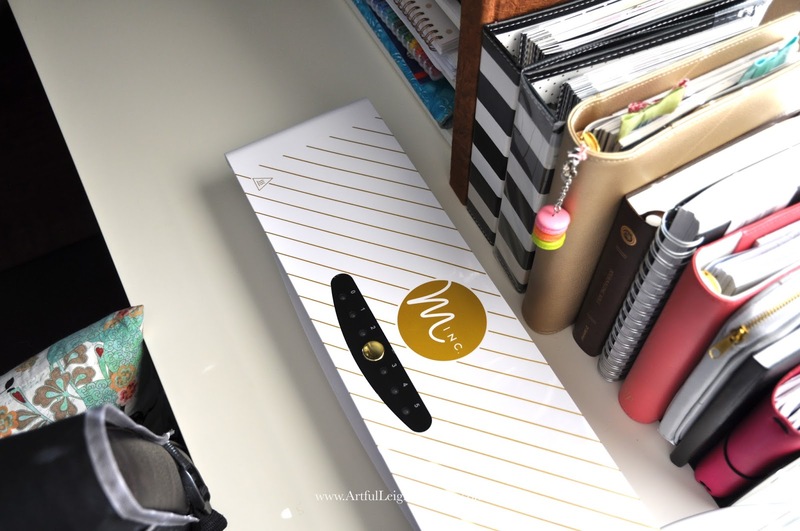 The file folders to the right of there, hold tips for Adobe Photoshop, Lightroom, Silhouette tips, and Neenah Solar White Card Stock for printing the Clique Kits exclusive printables included each month, and any other printables. 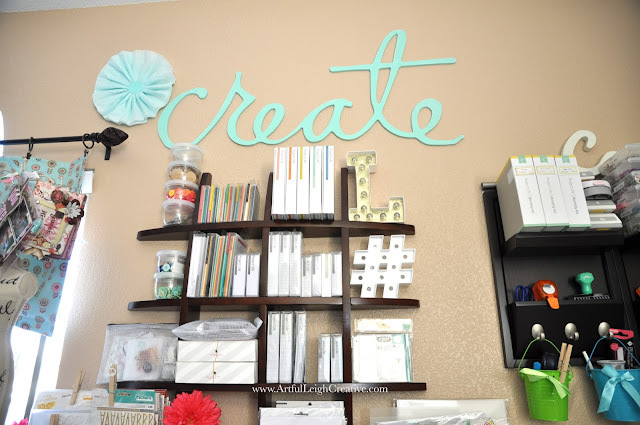 More Project Life® cards and Studio Calico Kits, and the “Create” word is from Heidi Swapp Hello Signature Wall Art. I have a couple more pieces to paint and hang in here as well. Love them! I got the wall organizer at Lowes, and it is for holding CD's. Here at the planner station, you can see my completed Week In The Life™ and #Myselfiescrapbook 6×8 albums, and my little West Elm succulent plant just makes me happy in that gold dot container! More Target Dollar Spot buckets hold different journaling and planner pens that I use here. In Design School we learned to store items at their point of use, for the most efficient room design. I tried to employ that technique throughout the room. Where do I use an item? 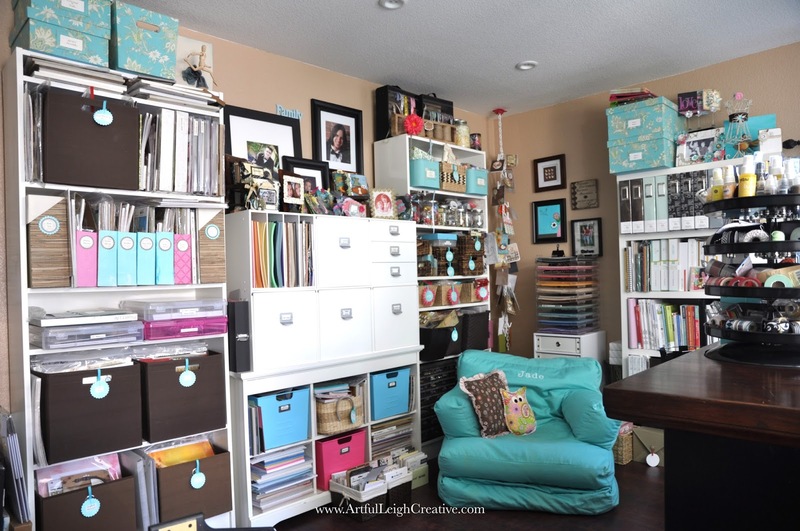 Then incorporate storage there. A close up of my different planners and full size Minc Machine I got on sale!! 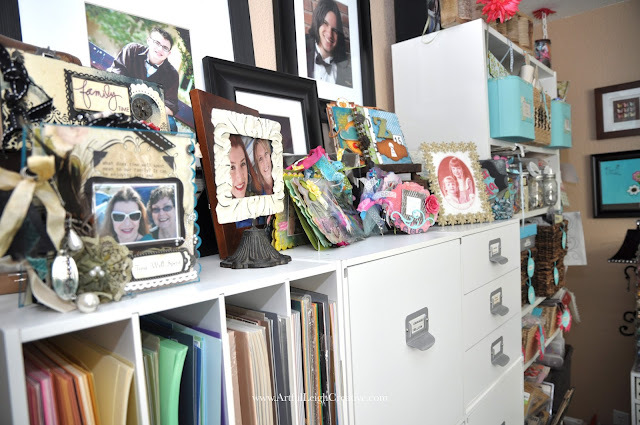 Here you can see the cabinet my sister sent to me, on the floor that holds Sizzix dies. I stained it to match the floor and the craft table. Love it Sis! Next to that are my Cricut Machine and a Clip It Up spinning organizer for rarely used embellishments. Behind curtain one on the left is the Die Cut Station. Behind curtain two is the Stamping Station. 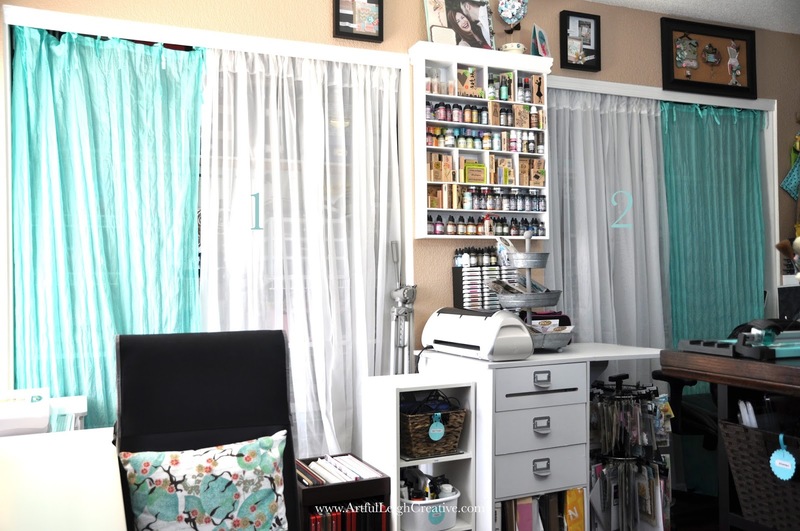 Curtains open on the Die Cut Station. Dies, embossing folders, letterpress plates, and materials to cut are here. I have baskets with Fun Foam, Acetate, and repurposed chipboard labeled for use. Photos organized by year and month are above. I made sure to have LED lights so they are archival safe and don’t emit UV light. Stamping closet holds all stamps, pads and reinkers, Distress Inks, Alcohol Inks, and mists. Basically anything that could be messy, is in here:) Masks are hanging from a recycled cafe rod. I had installed this pegboard that the home improvement store cut for me. 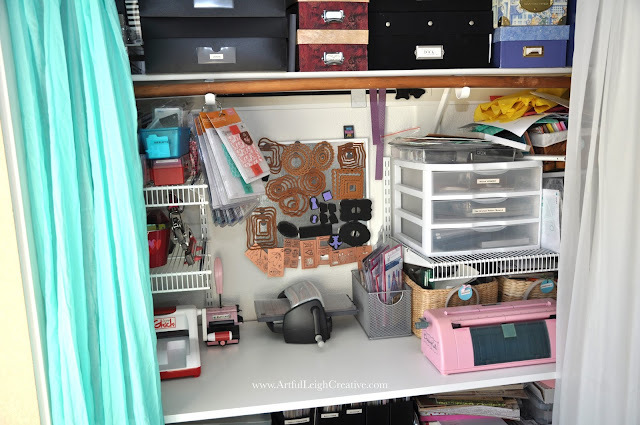 It’s so inexpensive and a great way to organize lots of things. I used chipboard from packaging to hold the small ink pads, reinkers, and other stuff. Simply laid the chipboard on the flat peg board hooks. Close up of the stuff I keep close at hand on the standing height craft table. Kellie Stamps, Studio Calico Stamps, Heidi Swapp Color Shine, spinning tool caddy, and more. 2015 Craft Room Tour Video on You-tube!!!! 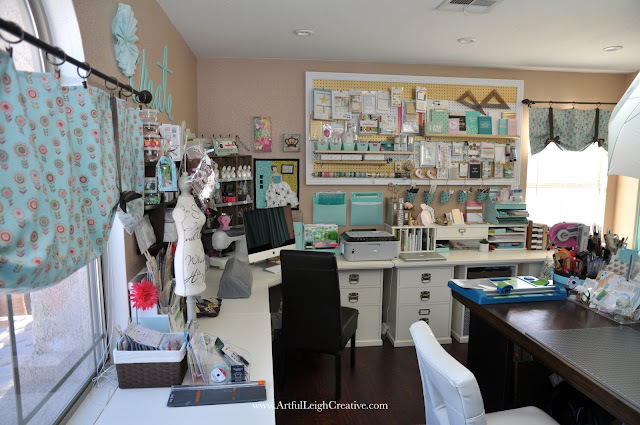 Thank you so much for joining me on this long craft room post! Thank you to Clique Kits for featuring my space and allowing me to share!! You have a beautiful space! I really enjoyed this! Thanks for sharing! 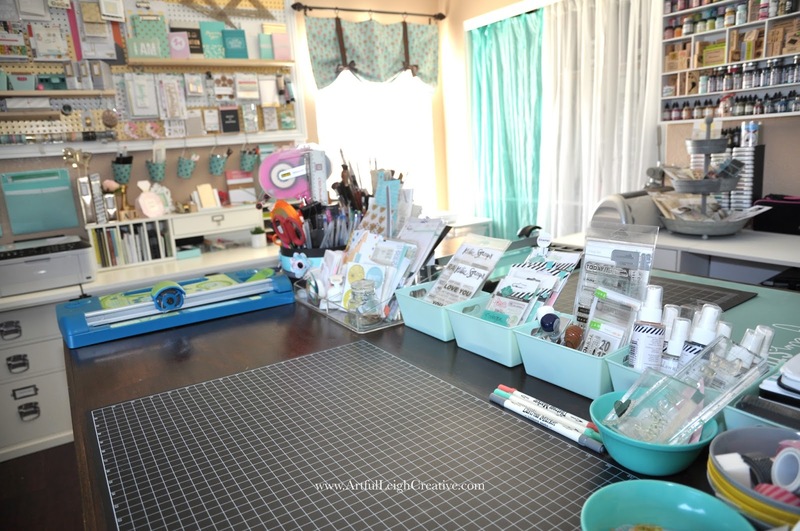 Your craft space is AMAZING! 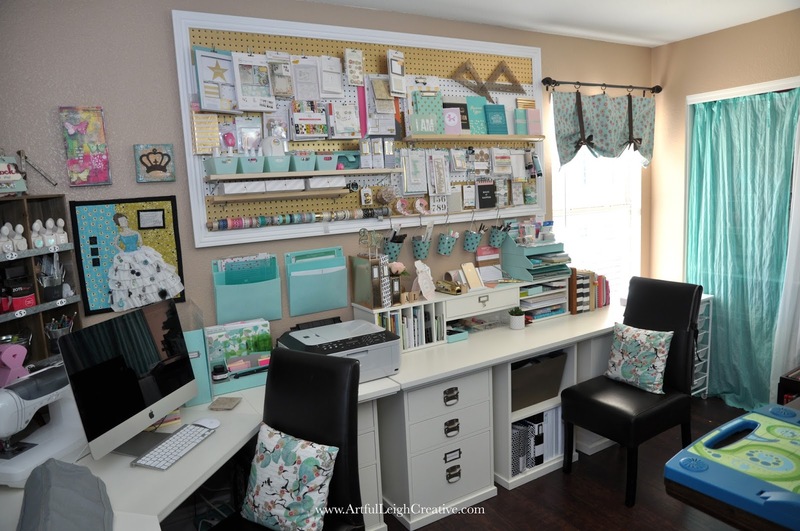 Love that pegboard!